Airbags are one of those things that can never serve the same purpose twice. Once deployed, these life saving bags of air that prevent a driver’s face from crashing into the steering wheel on impact are cut out and replaced. So, instead of tossing the material from used airbags into trash-cans, the guys at MariClaro recycle it all into trendy backpacks. Based in Toronto, the sustainable design company makes fashion accessories and apparel from recycled materials. This backpack in particular is made from 99% recycled materials and takes up to three weeks to make. However, the $300 price tag might seem a bit too hefty on one’s pocket, though we applaud the idea behind this recycle-reuse idea. Sipping coffee was the only way to stay warm using coffee beans, until now. Californian sports clothing company Virus has just pulled the veil off its new line of exceptional clothing using a one-of-a-kind fabric made from coffee! Using recycled coffee charcoal to produce fabric, Virus’ new line of clothing traps heat close to the skin, keeping you warm. These fabrics can trap heat of up to 10 degrees Fahrenheit and uses no chemical treatments or applications for insulation. 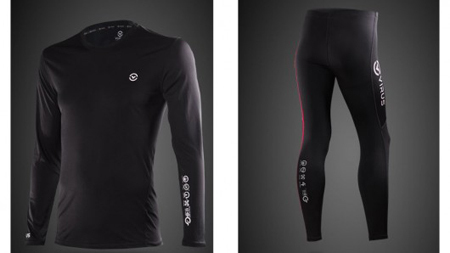 Called the StayWarm line, these also shield you from harmful UV rays and keep odors away. A great way to stay warm using recycled coffee charcoal, the Virus StayWarm line further promotes recycling as a brilliant way to gather raw materials. When remarkable individuals come up with ways to recycle materials that could potentially harm the environment, and come up with ways to reuse them for the betterment of mankind, they deserve more than just a common applause. My Shelter Foundation is one of those organizations that make us believe in the gentleness of mankind. The foundation has been using plastic bottles and recycling them to build classrooms in Philippines! The plastic bottles are reinforced with cement, soil and water and are strong enough to face the elements, making an ideal raw material to build structures. Currently, a school is being built in Laguna using this technique and will also use natural lighting and solar bulbs for lighting. We love recycling and hearing about stuff being recycled leaves us smiling like overjoyed infants. Instead of having old retired computer monitors tossed in e-waste dump yards, designer J Edson Azevedo came up with a fantastic way to have the recycled. 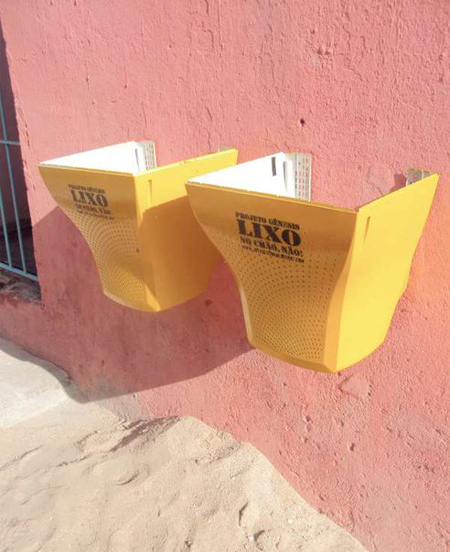 By scooping out the insides, Azevedo put these shells to use as trash cans, mounting them on walls in public spaces. Painting these a soothing yellow color that grabs the attention of the potential litterer and has him or her dump waste in these recycled monitors instead, the initiative tends to inspire and motivate. German designers Charlotte Dieckmann and Nils Ferber have come up with a fabulous way dispose away all the waste food your home generates. 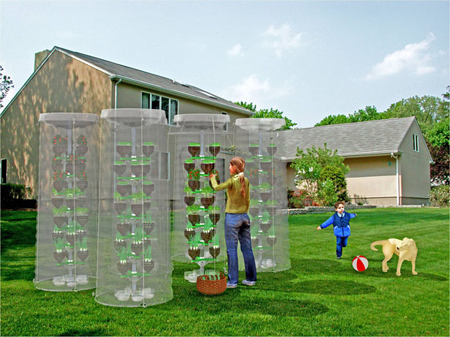 The Parasite Farm is the perfect addition for the urban home that lacks the outdoor space for a proper composting area. Today, food waste is known to make up about 13% of trash in the United States alone, and composting it at home could help decrease the strain on landfills. 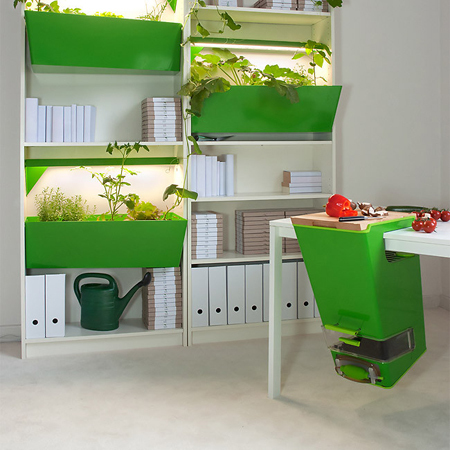 Sporting a compost bin with a built-in chopping-board lid that can be mounted onto a kitchen table, the Parasite Farm enables you to turn your kitchen waste into soil, which can then be used to grow veggies indoors! Also, the system makes use of residual water that doubles up as fertilizer water, making the Parasite Farm an ideal way to get rid of food waste at home. With the Chinese New Year just around the corner, 54-year-old Fu Sek Sue has come with the ideal way to usher in the Year of the Dragon. 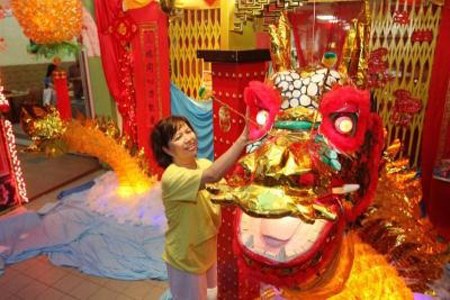 Sue, who owns a restaurant called the Golden Dragon in Kampung Cina, has built a miniature dragon, made from recycled materials. The dragon was sculpted out of recycled bottles, cardboard boxes, paper and a bunch of reusable materials she salvaged. With help from her three children and friends, this majestic dragon now stands at the front of the Golden Dragon restaurant in China, and has also been attracting a steady stream of customers ever since it showed up! Re-Wine biodegradable reusable wine cases transform into lamps, tables, chairs and shelves! Using the concept of Reuse and Recycle in a manner never executed before, designer Miniwiz’s Re-Wine design sure takes the cake when it comes to reusable packaging. A biodegradable carrying case for your wine, this cleverly designed contraption turns into a full-fledged table-lamp when it serves its purpose as a carter for your wine. And that certainly isn’t all! 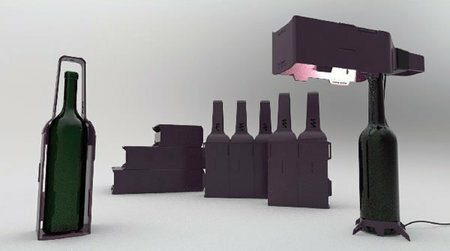 If you really aren’t looking for a lighting solution either, the Re-Wine uses interlocking joints that enables it to be connected to other similar units to form house-hold furniture including tables, shelves and seats! And if you simply aren’t looking for anything of the sort, these cases are fully biodegradable, meaning that you can toss them into nature (safely), without this causing harm to the environment! Why connect street lamps to the grid when you could have your pooch power them up instead, with poop! 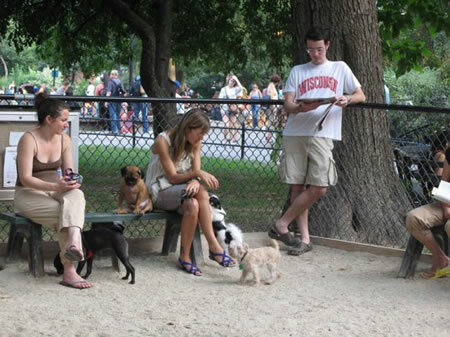 NYU student Melody Kelemu envisions street lamps in parks powered by dog poop and if this concept does turn into a reality, it pretty much could work out to be a great way to keep parks free from doggie-poop while staying lit up at the same time! The neuroscience and environmental studies student’s concept includes the use of methane digesters that use anaerobic bacteria to digest the poop, creating methane. Also, if you’re one to worry of doggie-poop smell, Melody has made sure her digester tank designs are hermetically sealed! A perfect way to light up the parks of New York in a green and eco-friendly way, while keeping the sidewalks poop-free, Melody Kelemu’s concept seems to be an efficient, green and practical solution indeed. In an endeavor to keep PET bottles away from landfills and helping bring greener life forms closer to our daily lives, designer Dr. Hakan Gursu designed the Pet Tree Vertical eco planting system, a winner of the Green Dot Awards and the International Design Awards. The system uses old PET bottles structured in such a way, that they replicate a tree-like shape. The system then uses a water-collection system that enables drop irrigation to replenish the greenery planted in the PET bottles. We’ve seen stores carved into recycled shipping containers before. Now, London plays home to a full-fledged mall, completely constructed out of recycled shipping containers, located at the east end. 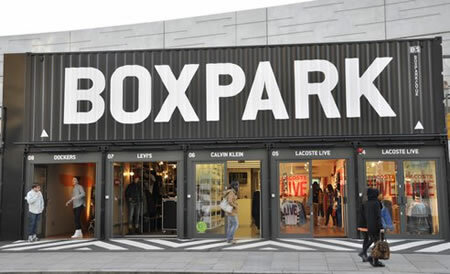 Called the Boxpark, this mall plays home to trendy apparel stores, and uses 60 containers stacked two stories high and five rows wide. The floors above host restaurants with outside benches and tables while the mall also brags of a concept store with gifts from Amnesty International apart from the regular Levi’s, Puma, Calvin Klein and Nike stores. Also, the stores vary in size, with some using two to three containers with unique displays, making this one of the greenest shopping areas in London. Top this one with solar panels, and voila! You could probably enjoy a true-to-flesh eco-friendly shopping area in the heart of London.